Sp. 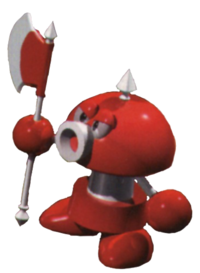 Attacks Vigor up!, "Glowing Shot"
Axem Red is the leader of the Axem Rangers and a member of the Smithy Gang who appears in Super Mario RPG: Legend of the Seven Stars. He is a balanced fighter and a tough opponent for Mario and his allies. Axem Red has the ability to power up his attack and defense. Eventually, all five Axem Rangers are defeated. However, Axem Red won't give up the Star Piece that easily. He rallies his companions and together they share their energies into the Blade's Breaker Beam. Axem Red personally takes command of the powerful energy beam. Ultimately, Axem Red's efforts are in vain, as Mario and his allies defeat the Axem Rangers a second time. This page was last edited on June 1, 2018, at 15:21.